As designers, we cycle between individual creativity and inspiration from what we see around us. 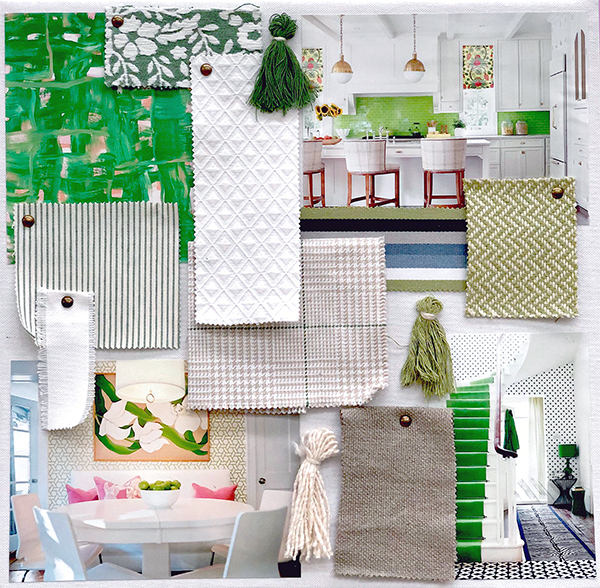 We made the following mood boards to help us envision how the textures, colors, and patterns that we (literally) wove together this season, work together as a cohesive and relevant line of fabrics. You can see how our fabrics correlate with one another and with broader design trends emerging in the marketplace. Hopefully, by sharing these ‘collages,’ you will find inspiration in your own creative process. In our Global Artisan family we imagine burnt hues, earthy tones, and a handmade feel to spice-up domestic interiors. As people travel to far-away lands they are inspired to bring home the customary beauty of the places they visited. We developed a series of fabrics inspired by organic textures and artisan techniques to create a thought-provoking and inspiring environment. To calm the chaos of the outside world—creating a safe, comforting, and tranquil space to escape to when returning home—is exactly what we envisioned when designing our Transitional Retreat line. Washed linens and plush chenille fabrics offer a welcoming feel; this, combined with the soft hues of blues and beige, evoke a sense of serenity and soothing. We hope to help you create your own retreat and make every day a vacation. Clean, white, modernist—look-out! Don’t get us wrong, “minimal” and “quiet” are good, but sometimes life needs a little POP! Inspired by the Memphis style of the 80’s and 90’s, this family is pulled together by the bleach grounds and vibrant graphic pops. This collection is for the creative and optimistic home, sparking a vivacious energy with every fabric and giving life to the world around you.